This class provides you with the concepts and skills to use HTML effectively. You get hands-on practice working with basic through advanced techniques to get the most out of your experience. First we go through the basics of using Adobe Dreamweaver. You will learn the basics of coding for web design, beginning with HTML and CSS. We use Adobe products for all our courses. 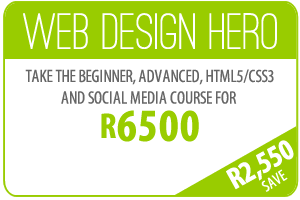 For this course you will use Adobe Dreamweaver and Adobe Fireworks. This class also provides the web professional with the ability to control the rendering, e.g. fonts, colours, leading, margins, typefaces, and other aspects of style of a Web document without compromising its structure using Cascading Style Sheets. Using common desktop publishing terminology, Cascading Style Sheets makes it easy for professional as well as untrained designers to make use of its features. People new to Web design that desire a deeper understanding of HTML & CSS, and the new standards of web design. There is nothing worse than leaving a course and feeling left on your own. We like to ensure our customers have all the support and backup they need which includes 90 days unlimited support by phone or email. You also get lifetime support through our Resource Centre. The most complete intro course you can find on HTML and CSS. Come visit us on the South Coast of South Africa. Durban weather is great all year round. Study, Surf and Learn how to Design Websites.